Call us on 0207 627 4901 for a free consultation to discuss the treatment of your fungal nails. A free diagnostic test will be performed: A small sample of your nail is removed and cultured to make a positive fungal diagnosis before treatment commences. The Fotona advanced medical laser has exceptional success rates curing fungal nail infections. With over 50 years of experience in laser technology, Fotona’s lasers systems is leading the industry with new levels of innovation and performance. Fotona is recognized as a world leader in aesthetic applications and technologies, working closely with top universities and medical research centers around the globe. The Fotona medical laser produces a deep light pulse that heats both the nail and nail bed causing the death of parasitic fungus within the nail. The effects of the laser light spreads evenly throughout the tissue, eliminating the fungal infection. The natural growth and immune processes of the body are then able to restore the nail to its pristine state. Traditional methods of treatment such as nail paints are subject to the limits of chemical diffusion. This is not the case with laser therapy which has been shown to penetrate the entire nail and nail bed, delivering a treatment to the entire infected area. The laser is safe to use and does not have the toxic side effects to the liver that some oral medications cause. Step 1: Fitter Feet For Life uses professional electric nail files to reduce the fungus and size of the infected nail. Filing down the nail allows laser light to fully penetrate into the treatment site. Step 2: The laser is administered in pulses in a circular pattern covering the entire nail. The beam is applied point by point so that the nail is fully covered. The patient feels a heating sensation throughout the nail. Step 3: The laser pulses around the perimeter of the nail bed and around the toe. Often parasitic fungus has worked its way beyond the nail bed and needs to be eliminated in all the tissue surrounding the nail to prevent recurrence. The treatment is usually performed four times at one week intervals. All of the nails should be treated, during every treatment, as early fungal infection can be invisible to the eye. The Fotona medical laser penetrates the nail efficiently, safely and evenly, heating the nail bed to an appropriate temperature that results in the elimination of the invading fungi and the restoration of the nail. In just 12 months most patients are completely cleared from Onychomycosis with just the use of the Fotona laser. Severe infection will require additional courses of treatment. It is always best to treat the infection as early as possible, particularly before it spreads to other nails and the nail root. Fungal infection of the toenails is called onychomycosis. It is extremely common and affects up to 10% of people in the UK. In fact almost half of all nail problems are related to fungus. It is more common as you get older and affects men more than women. It is more common in toenails but can also infect fingernails. Fungal infections of the nails are unsightly and embarrassing. 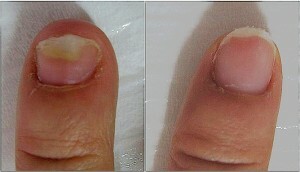 The nail becomes thickened slowly becoming yellow, brown, orange or white. The nail becomes crumbly, smelly and difficult to cut. As the fungal infection becomes thicker the nails are painful in shoes and may bleed causing black areas inside the nail. Nails with fungal infection can become brittle and crack, and may lift away from the end of the toe. This allows debris to collects underneath the nail causing an unpleasant smell and allowing the fungus to continually re-infect the skin and other nails. Many of our patients suffer embarrassment and self-consciousness from the appearance of their fungal nails. Fungus often infects nails after the nails are slightly damaged in some way. The hot sweaty environment inside shoes then offer a perfect environment for the infection to thrive and slowly destroy the nail. It is thought that 30% of people with nails fungus also have a fungal skin infection. There are four distinct types of onychomycosis (nail fungus). Distal subungual onychomycosis is most common. It is caused by a fungus dermatophytes; the most frequent type is called Trichophyton rubrum. It invades the underside of the nail bed and the nail plate. White superficial onychomycosis is caused by fungus infecting the upper layers of the nail to form white areas of discoloration. It has a chalky white texture. Tinea Unguium is a fungus that can penetrate a newly formed nail through the nail fold and is more commonly seen in patients who are immunosuppressed. The Candida species more frequently invades fingernails and occurs in people who immerse their hands in water frequently. 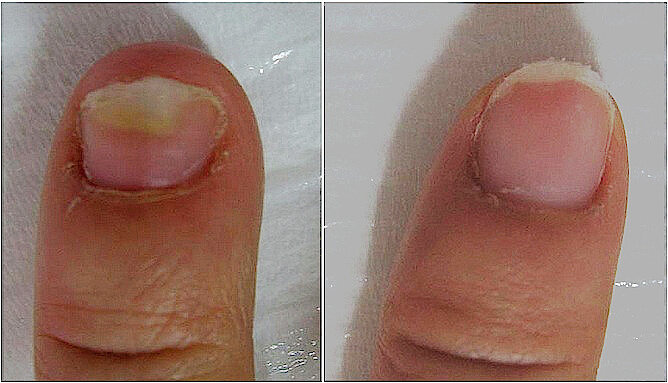 The nail is often initially damaged, allowing entry of candida inside the nail where it then grows causing nail destruction and discoloration. Some factors increase the likelihood of having a fungal nail infection. Your toes feel more comfortable when inside shoes because they are no longer thick and crumbly. Your feet feel healthy and comfortable. You won't infect your friends and relatives. Excellence in Training and SupportBy establishing the Laser and Health Academy, Fotona has partnered with world-leading clinical experts to provide medical practitioners with a platform for continuing their professional growth. Fotona customers receive access to professional workshops, individual training sessions, hands-on demonstrations, as well as participation in international clinical studies and international scientific symposiums. Fotona is also a founding member of the EU Competency Center for Biomedical Engineering, and of the EU technology platform Fotonika21. 1. Harris DM, McDowell BA, Strisower J. Laser Treatment for toenail fungus. Photonics Therapeutics and Diagnostics V, SPIE Proc. 2009; Vol. 7161. 2. Hochman LG. Laser treatment of onychomycosis using a novel 0.65- millisecond pulsed Nd:YAG 1064-nm laser. J Cosmet Laser Ther, 2011; 13(1):2-5. 3. Vural E., Winfield HL, Shingleton AW, Horn TD and Shafirstein G. The effects of laser irradiation on Trichophyton rubrum growth, Lasers Med Sci., 2008; 23(4):349-53. 4. Kozarev J, Vizintin Z. Novel Laser Therapy in Treatment of Onychomycosis. J Laser Health Academy, 2010; 1:1-9. 5. Rodgers P, Bassler M. Treating Onychomycosis. Am Fam Physician., 2001; 63(4):663-72. 5. Kozarev J, ClearSteps – Laser Onychomycosis Treatment: Assessment of Efficacy 12 months After Treatment and Beyond. Journal of the Laser and Health Academy, Vol. 2011, No.1. 6. Wanitphakdeedecha D. Treatment of Onychomycosis with a Long-Pulsed Nd:YAG Laser. Journal of the Laser and Health Academy, Vol. 2011, No.1.